The past week's heat and humidity was not accompanied by much output from Ontario's wind turbines. 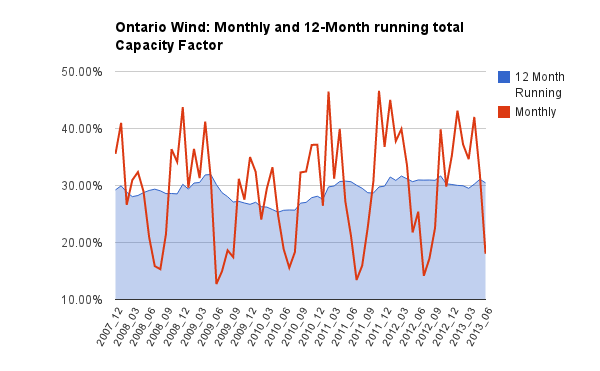 This is a quick post to demonstrate that last week's wind output was a typical level of production for an Ontario July. The capacity factor is determined by calculating the period's actual generation divided by the total generation that would be produced in the units produced at 100% of capacity throughout the period. Ontario's system operator posts hourly records of the wind turbine facilities on it's grid (which is not a comprehensive list of wind production in Ontario) - the file can be downloaded from this page. The figures behind the graphs produced for this post are similar; there is some variance after September 2010 as the figures I collect are from the Generator Output and Capability reporting, and I have discarded any data for generators prior to their entering commercial operation (most of those dates are taken from the Ontario Power Authority site). Monthly reporting gives a poor view of the utility of generation from industrial wind - there are periods on very little production in high production months too. 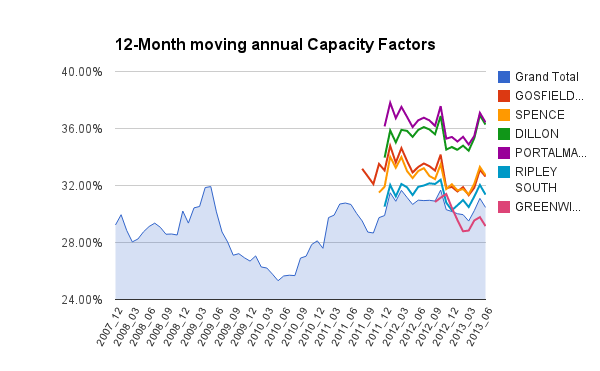 The 12-month averaging shows the average is about 30% of the nameplate capacity is the average generation. 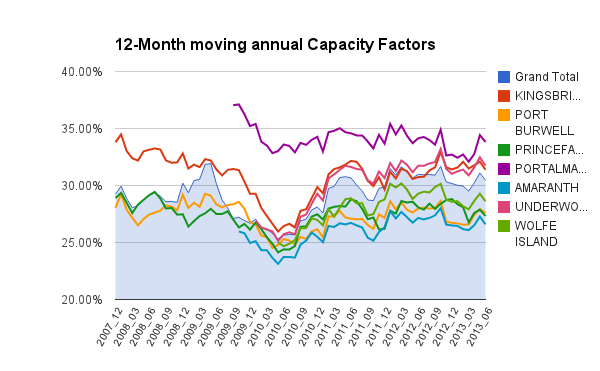 ... and the recovery of the capacity factor to the 30% level might be attributed to more productionturbines being installed. I suspect there's some truth to both assertions: the turbines do suffer a drop in performance as the age, and new turbines are probably more productive.